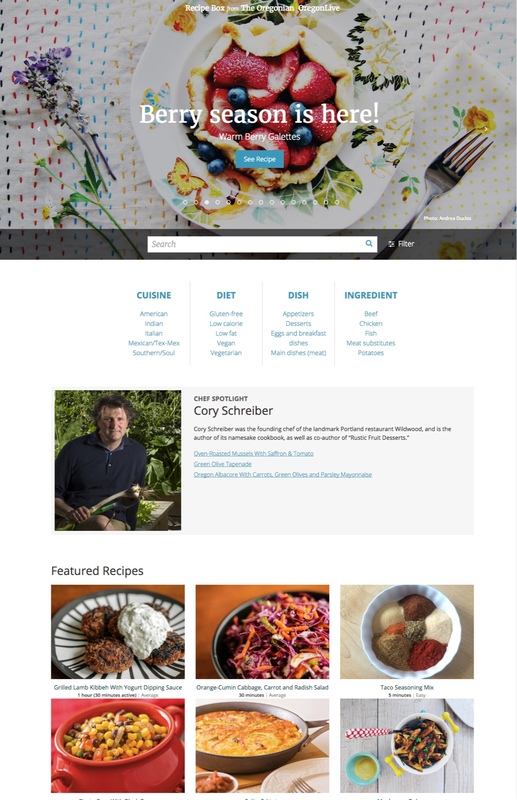 A reimagined, re-engineered responsive directory of over 3,600 recipes that fosters exploration and inspiration. Learn how we re-envisioned a tool for staff to showcase content and increase traffic to their site. When local media company The Oregonian/OregonLive approached us, it was clear their platform had reached its limit. 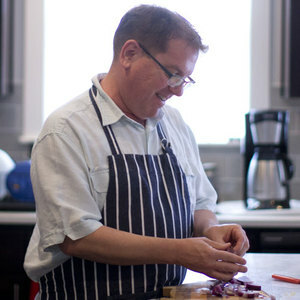 They were currently maintaining an online directory of over 4,000 recipes curated since 2007: Recipe Box. The Recipe Box experience was compromised by an unscalable framework. This left readers with insufficient tools to filter and search for a specific recipe. The existing platform also couldn’t provide SEO-friendly URLs (they were all at the same URL with a query string ID to identify the recipe). This made it time consuming and difficult to measure traffic and social shares on the site. 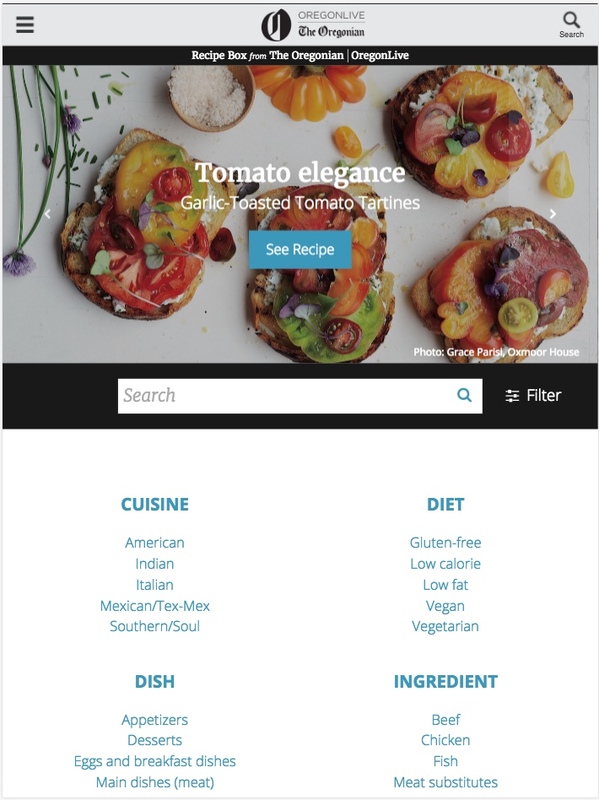 We focused on three main templates: the homepage, landing page for recipe categories, and the recipe page itself. 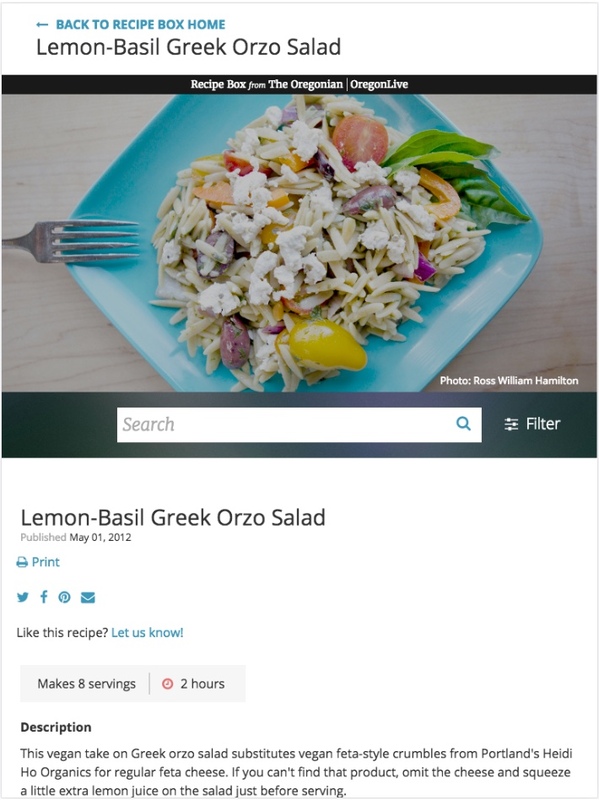 Together, these would encourage searching and sharing recipes. By creating these as templates, we could maintain a standard layout. Our designs highlighted recipes with beautiful imagery to showcase the dishes and provide inspiration. These pages leveraged a familiar pattern, highlighting helpful cooking tips like duration and difficulty. This template also ensured that updating and creating pages by staff was consistent. 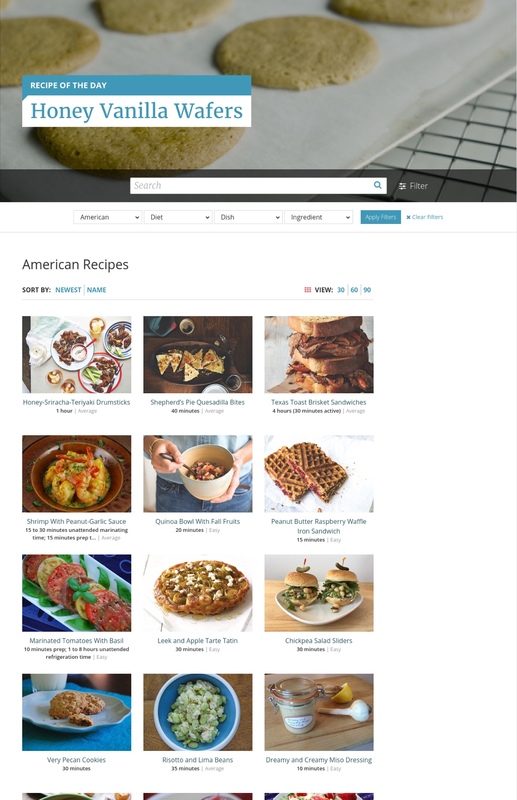 We developed a content management system (CMS) that permitted admins to add content, curate featured content, and connect recipes to categories and authors. 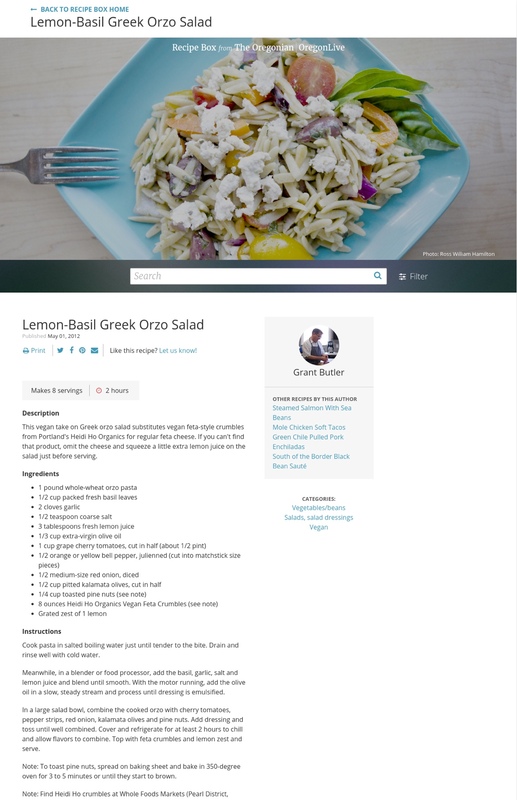 Lastly, we ensured each new page was published with an SEO-friendly URL so staff could track recipe usage and popularity. Our focus stretched beyond creating an experience that enabled and encouraged readers to search, explore, and share recipes. We sought to build a scalable and easy-to-maintain database for OregonLive staff. The end result was a more inspiring, expertly curated, and searchable application. 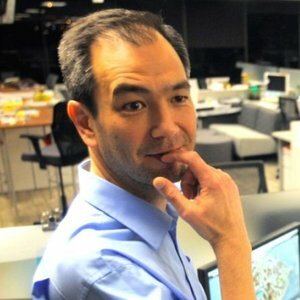 Since launch, they’ve noted a huge increase in traffic. In their busiest months, the revised application has also freed up time to focus on other content. From the Blog A New "Recipe Box"